The Whipple Avenue Caltrain crossing in Redwood City. Google Streetview photo. Redwood City is still working on options to separate train tracks from roads with bridges, lagging behind other mid-Peninsula cities. City and San Mateo County Transit Authority officials are looking to move forward with a study that will look at what’s called a grade separation at Whipple Avenue near El Camino Real, city spokeswoman Meghan Horrigan said Thursday (June 7). 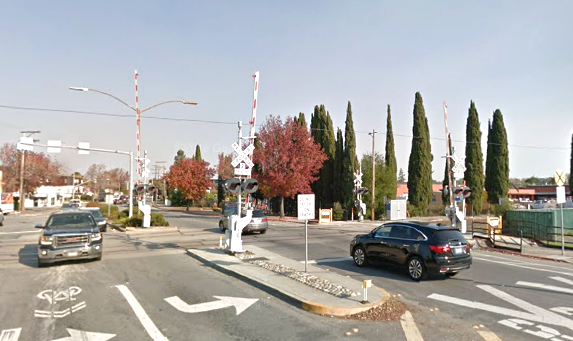 The Transit Authority in November approved $750,000 for the city’s grade separation study. The study in part will look at how separating the train tracks from Whipple could impact Broadway and Arguello and Marshall streets. Other crossings could be included in the study as well. It’s not known how much a grade separation at Whipple would cost since project plans are still in the works. 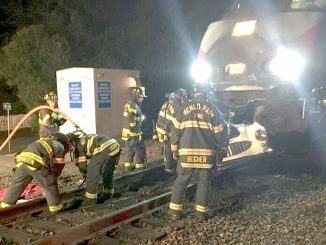 Cities are working to separate tracks from the roads because Caltrain will be running trains more frequently after it switches from diesel to electric locomotives. That will create traffic backups. Menlo Park has looked into three grade separations at Ravenswood, Oak Grove and Glenwood avenues, which was estimated to cost about $380 million. Just separating the tracks at Ravenswood is estimated to cost about $190 million. San Mateo’s project at 25th Avenue is an example of what Redwood City may end up having to do. 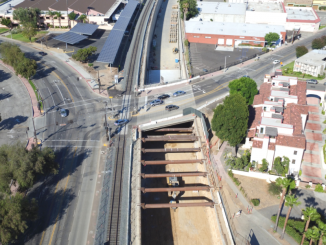 San Mateo is raising the tracks between Highway 92 and Hillsdale Boulevard and slightly lowering the road at 25th Avenue. This project is scheduled to be completed by 2020 and cost $180 million. It took city officials 15 years to get all of the needed funds in place. While Redwood City is still working on plans, Mountain View City Council has decided to build a train bridge at Rengstorff Avenue and to dead-end Castro Street at the train tracks. Palo Alto has long been studying what to do with its train tracks at Charleston Road and Meadow Drive, Churchill Avenue and Palo Alto Avenue. Last month, the council narrowed down its options for the four crossings from 34 to 10 and is expected to slowly whittle away at the other options at meetings later this year. I think the city should bill the high speed rail agency for these bridges, just like CalTrain should have charged them for electrification. We’re doing this because of Jerry Brown’s train fetish. Maybe because Redwood City is too busy building apartment complexes in every square inch of the city and still, none of them are affordable. Shouldn’t cost Redwood City anything at all! Bill San Carlos for the work, it’ll be their residents that benefit from this. How surprising….Redwood City (aka the cheap development date on the Peninsula) is late to the game on addressing needed impacts. It’s a little tricky going back and asking developers for money after we rolled out the red carpet for them getting little in return. Maybe the residents would be receptive to an even bigger sales tax increase than the one they are proposing in November?